There’s no need to wake up early to make this satisfying breakfast featuring roasted asparagus and poached eggs. 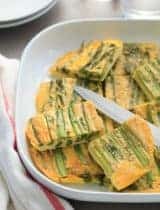 This is just the kind of meal I keep in heavy rotation during asparagus season. It’s quick, easy and a terrific combination of tastes and textures that’s always satisfying. I’ve called it breakfast, lunch and dinner because it’s a natural for any time of the day. 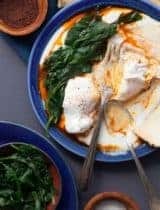 It’s really a fairly straightforward combination of ingredients, layered for presentation and tied together with a creamy but delicate sauce. Fresh asparagus spears topped with a delicate poached egg are at the center of this particular dish. This is my lighter variation on Eggs Benedict. I’ve swapped out bacon for asparagus and an English muffin for a roasted portobello mushroom cap. I’ve also done away with the hollandaise sauce in favor of a lighter, tangier and super quick goat cheese sauce. This makes for a dish that’s at once hearty but cleaner and fresher tasting than its namesake. 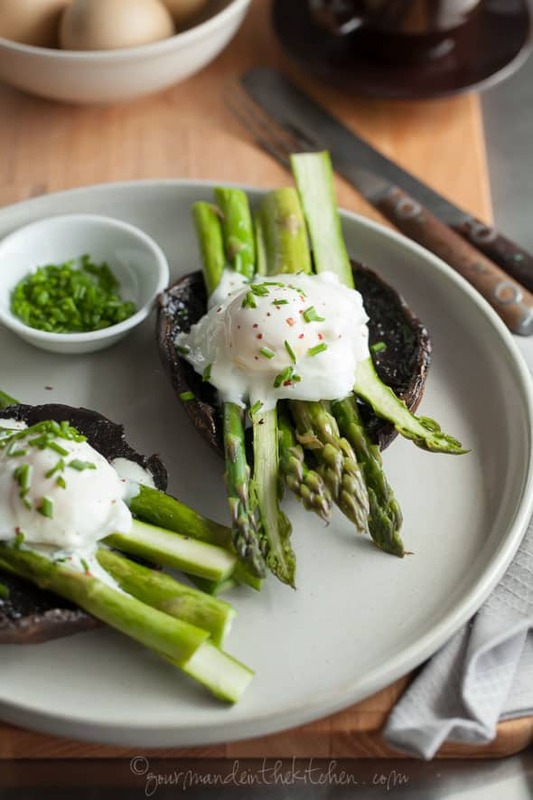 The portobello caps and asparagus spear roast quickly in the oven while your eggs are poaching and the goat cheese sauce is whizzed up in no time in the blender in order to keep things as simple as can be. A scattering of chives across the top brings a touch of freshness and green to the final dish. This is also one of my favorite weekend brunch dishes because it easily feeds a crowd if you double the quantities. Basic, comforting, versatile; it’s a lighter spin on an old standby. What are some of your favorite breakfast or brunch dishes? 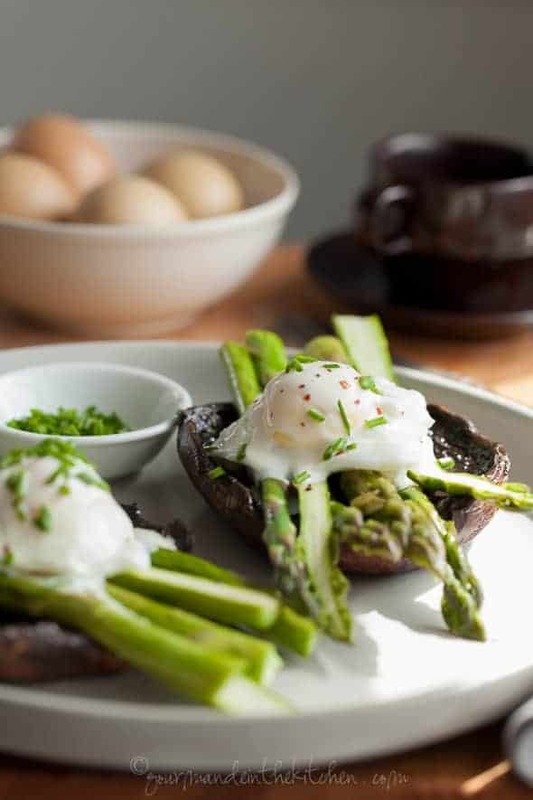 A lighter variation on Eggs Benedict featuring portobello mushrooms and asparagus. 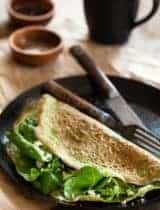 Combine the goat cheese, 1 Tablespoon of water, the lemon juice, 1/4 teaspoon salt, and 1/8 teaspoon white pepper and 1 Tablespoon of olive oil in a small blender or food processor. Blend on high until smooth. (You can double the goat cheese sauce recipe if you don't have a small blender or food processor and just save half for later use.) Set aside. Heat broiler. 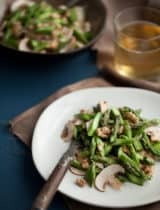 Brush the mushroom caps and asparagus (if your asparagus spears are very thick cut them lengthwise) all over with remaining 2 Tablespoons of the oil and minced garlic and season with a few pinches of salt and pepper. Place mushroom caps on a baking sheet and broil stem side down for 5 minutes. Flip the mushrooms and add the asparagus spears to the sheet. Broil for an additional 3 minutes, or until tender and lightly golden. Bring a shallow pan of salted water to a gentle simmer. Carefully crack each of the eggs into the water. Turn off the heat, cover and let sit for 5 to 7 minutes (depending on how runny you like your yolks), then carefully remove from the pan using a slotted spoon and drain on a clean kitchen towel. Top each mushroom with a few asparagus spears and a poached egg. Spoon goat cheese sauce over along with an extra sprinkle of pepper and chopped chives and serve immediately. This sounds SO good! 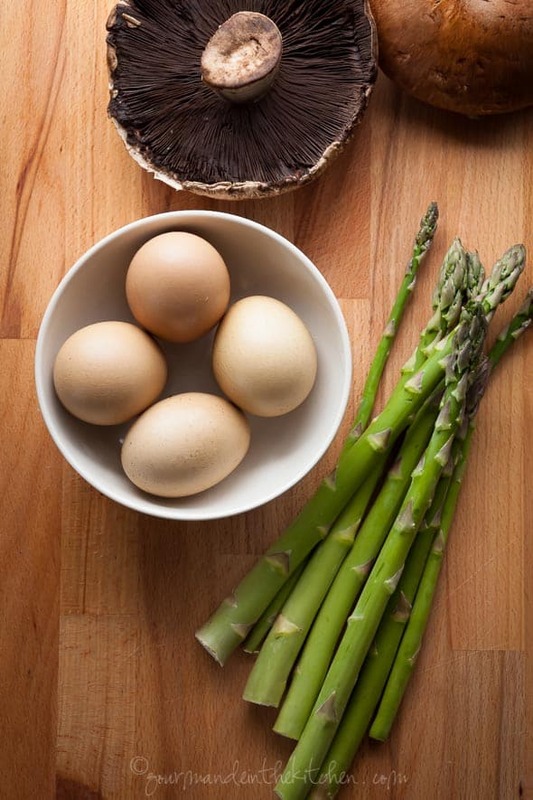 I love the idea of serving the eggs and asparagus over a portobello mushroom– I think it would be really satisfying. I could totally see me keeping this on rotation too! I love that you made it lighter with the mushroom, but added EXTRA creamy goodness with that goat cheese! Pinned! Oh my goodness this sounds to die for! It will be perfect for Mother's Day brunch! ooo my word, I love the idea of using mushrooms in place of the bread! I've got to make these asap! I'm such a fan of portabellos and these look absolutely fantastic! This would make a great Mother's Day dish! That mushroom on the bottom is genius! Genius!! I definitely need to get on this! This is absolutely gorgeous! And exactly what I want to eat right now. Thanks for another asparagus dish to add to my rotation! Yum! 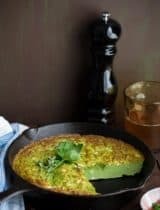 I'm always looking for breakfast recipes that include veggies :) Definitely going to give it a try! What a BRILLIANT idea! I am drooling over the pix! 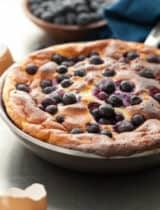 I might just have to make my own Mother's Day breakfast - this looks amazing! Everything about this looks divine. The goat cheese sauce must happen in my kitchen soon. And what perfectly poached eggs! I love eggs benedict, and I'm loving this creative take on it!! This looks lovely! Fresh asparagus is so good and I'm super impressed with the swaps -- love the mushroom in place of an english muffins. What a great idea. Fabulous grain free brunch. Pinning. 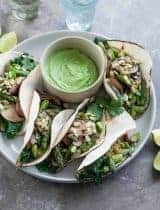 I love absolutely everything about this recipe, and have all the ingredients minus the mushrooms :-) Can't wait to try this! What a lovely twist to the classic version! I love eggs benedict. Breakfast heaven! I so love portobello mushroom caps and stuff them with all kinds of tastiness. Asparagus and topped with an egg is a new one - and looks so tasty and filling. Makes me want to eat eggs and cheese again, haha. Looks great! How much goat cheese is needed? I don't see it on the list. Hi Sarah, the recipe calls for 2oz of goat cheese.